Last week, the d30 Ghoul/Ghast Generator was the winner of the "Which Undead d30 Chart Do You Want to See" vote by a slim (single, tie-breaking vote) margin, with 2nd place as a tie between mummies and spectres... so mummies it is! 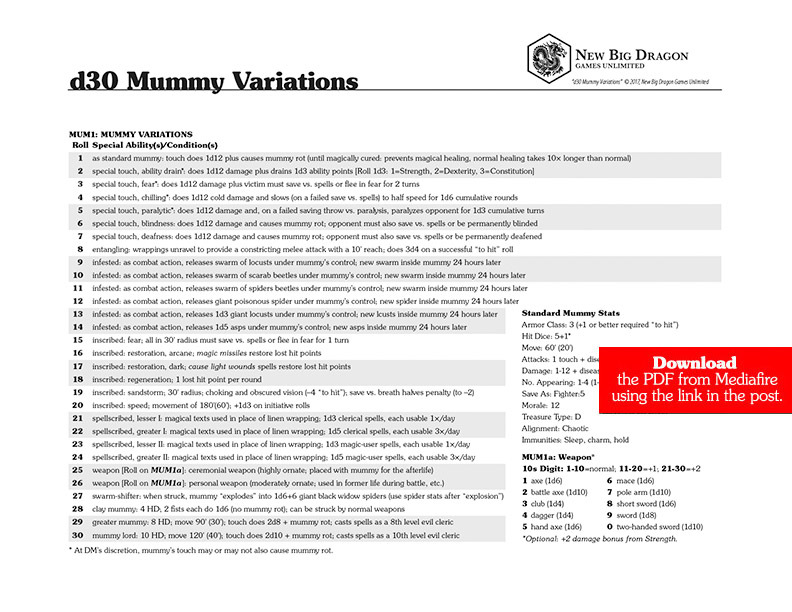 a free PDF of d30 Mummy Variations PDF from MediaFire. Those who are circled in with me on G+ know that, for a few weeks I have been posting a new magic item every day to my "New Magic Items" collection. At some point (several months to a year from now) I plan to collect them and publish them. However, every once in a while I will collect the recent creations and post them here (at the blog). So to get you caught up, here they are in reverse chronological order (most recent first). This potion is usable by anyone. Upon imbibing this potion, the drinker's visage changes to appear as if they'd become a spectre. This is an illusion that cannot be disbelieved by others. The imbiber does not become incorporeal, and retains their normal abilities. This item may only be used by those characters permitted the same items as magic-users. This piece of parchment appears as a contract between two unspecified parties. When read aloud, and as the two parties to the contract the caster uses his or her name and the name of a nearby undead spirit (e.g., a specific ghost, spectre, or poltergeist; within a 120' range of the caster), a truce is forged between the caster and the undead spirit. As long as the caster or the caster's associates do not harm the spirit, the spirit is bound to not harm them. The spirit is not, however, prohibited from being a nuisance or making it more difficult for the caster and the caster's associates to achieve a goal. This magical weapon is not allowed to characters that are forbidden the use of bladed weapons. This item is usable by any character permitted to use a bow as s weapon. This item may be worn by any character normally permitted to wear leather armor. However, it provides additional boons to those with thieving abilities. This item may be used by any character permitted to use a shield. This rectangular shield of dark iron is incredibly light and easily handled, despite it's rather bulky appearance. Its face features a vertically-elongated diamond overlaid through its middle with two interlocking rings (the triangle represents shadow and the circles represent light and dark—shadow being the place where light and dark meet). The bearer of this shield becomes naturally cloaked in shadow, benefiting from a –2 Armor Class bonus in all indoor and underground situations. (The benefit does not apply in full daylight or outdoors). Additionally, the bearer of the shield may shadow walk at will, stepping into a shadow and traveling through the Shadow Plane to another shadow within a 60' range. This item is usable only by magic-users and those with access to illusionary magic (e.g., gnomes with illusory magic). This 10" silver chain features seven glass beads, each approximately ¼" in diameter and differently colored (from left-to-right in the following order: red, orange, yellow, green, blue, indigo, violet). Red: The target takes 1d6 fire damage on a failed save vs. spells, or half as much damage on a successful one. Orange: The target takes 1d6 acid damage on a failed save vs. spells, or half as much damage on a successful one. 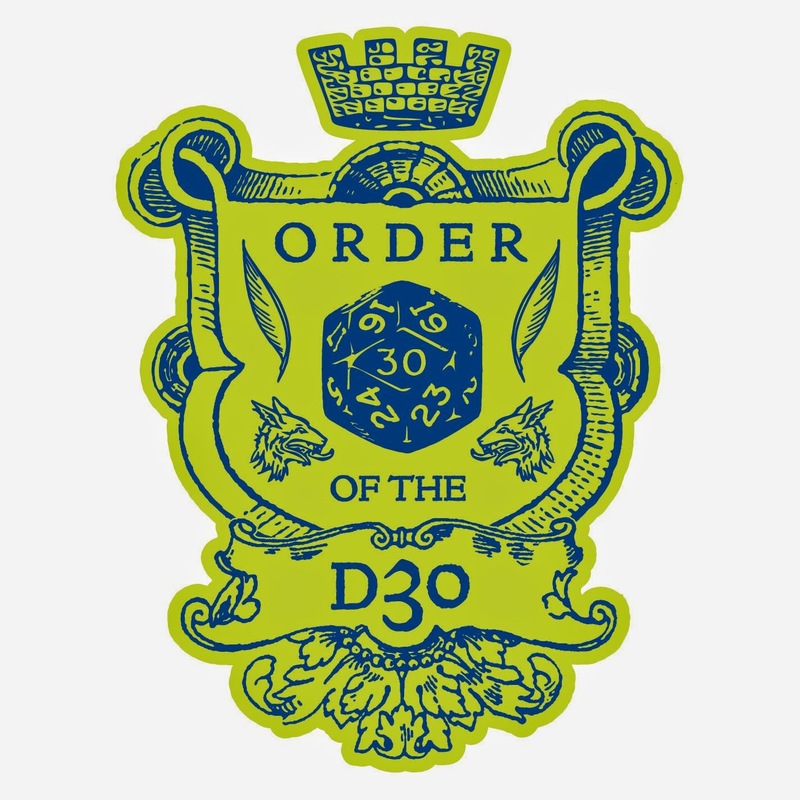 Yellow: The target takes 1d6 lightning damage on a failed save vs. spells, or half as much damage on a successful one. Green: The target takes 1d6 poison damage on a failed save vs. spells, or half as much damage on a successful one. Blue: The target takes 1d6 cold damage on a failed save vs. spells, or half as much damage on a successful one. Indigo: On a failed save vs. spells, the target is confused (as the spell) for 1d6 rounds. A successful save negates the effect. Violet: On a failed save vs. spells, the target is stunned for 1d6 rounds. A successful save negates the effect. If all 7 colors are used at the same time, the target is automatically blinded for 1d4 rounds. This item is usable only by clerical spellcasters of lawful or neutral alignment (non-evil), but any class or creature may benefit from its curing properties. When this decorative gold spoon is filled with purified water and prayed over by a clerical spellcaster for 1 uninterrupted turn, the water becomes a dose of a potion that will cure disease (as the spell). This ability of the spoon is usable 3×/day. Holy water will not be transformed, nor will water that has not been purified. This item may only be used by characters able to use those items as magic-users. This item is carved from ebony, with a core of red dragon bone. It works similarly to a ring of spell storing (storing a limited total number of spell levels), but gains spells by stealing them from an arcane caster within a 120' range. As a spellcasting action, the wielder need simply point the wand at a target and speak the trigger word, and the wand will absorb a randomly-selected spell of the highest level storable in the wand, remove it from the target's memorized spells for the day, and store it in the wand. If a spell of that level is not available, the wand will randomly steal a spell from the next level down. If no spell is available small enough to fit in the wand, the attempt fails automatically. The target is permitted a saving throw vs. spells to avoid having a spell stolen. To determine what spells have been stored in the wand requires 1 round of concentration while holding the wand. A spellcaster of any level may use any spell stored in the wand, regardless of the stored spell's level. Casters are permitted to steal spells from themselves or others who are willing (no saving throw required) in order to store spells for future use. Ringwood rings are normally usable only by clerics or druids. Some rings may be usable by other classes at the DM’s discretion. This item is usable only by psionic characters. A mystic's mala is a string of 108 wooden prayer beads tipped with a tassel. The item is designed for chanting or mentally repeating a mantra 108 times. By spending 3 turns (30 minutes) meditating and repeating a mantra 108 times, the character recovers 1 PSP per psionic level, up to the character's maximum. This meditational time is outside of the character's normal meditation (after a full night's rest to restore PSPs). The beads are usable only once per day; once any character has used them for the day, they cannot be used again by anyone until the following day. This item is usable by any character class, as long as it is in a form allowed to that character class. For example, a cleric may hold it while it is in the form of the dagger, but may not use it. The cleric may then wish for it to transform into a mace, and use it once it does. This +1 weapon appears as a finely crafted, but relatively unadorned specimen of any basic/standard handheld melee weapon type. The wielder simply need hold the item and wish for a different weapon, and it will instantaneously transform into that form. It may become as small as a dagger or as large as a pole arm, and may take the form of a slashing, piercing, or bludgeoning weapon. Alignment and class restrictions for use of this item are at the discretion of the DM. This hooded overgarment is sewn from deep red velvet and often crackles with static electricity (a byproduct of the magic coursing within it). The mantle provides the same resistances and immunities normally possessed by an abyssal demon: half damage from cold, fire, electricity, and gas; no damage from magical energy (e.g. magic missile), poison, or silver; and a +1 or greater weapon is required to hit the wearer. This item may not be used by those prohibited from using bladed weapons. Any character of any class or alignment may use this item. This item is usable only by lawful clerics. The wearer benefits from a +1 bonus on all attacks and saving throws, and a -1 bonus to Armor Class. The stole prevents 1 HD of level drain per day and provides and an additional +1 bonus (beyond that noted above) on saving throws to prevent level drain (where such a saving throw is permitted). At will, the stole shines equal to the light of a torch. 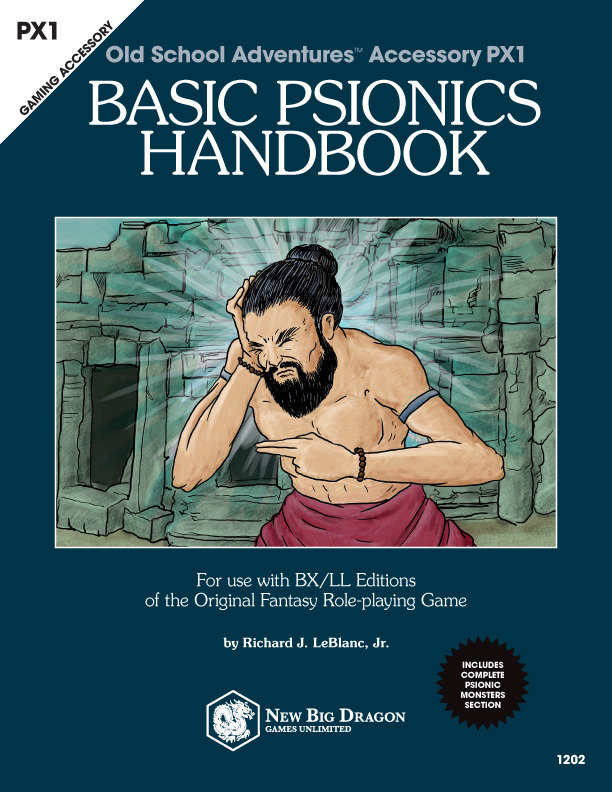 Turning the light off and on is a spellcasting action by the wearer, but does not limit or prohibit any movement, attacks, or similar physical actions normally allowed for the round. This item may only be used by characters able to use those magic-items normally reserved for magic-users. This item appears as a simple silver ankh about 3" tall, strung from a thin silver chain. This item normally provides the same benefits as a ring of protection +1. However, if a character dies while wearing this item, it has a chance of resurrecting that character. The base chance is 100% minus 5% per level/HD to a minimum of 1%. If successful, the character is resurrected (as a resurrection spell) a number of rounds later equal to their level/HD. Unclassed characters and those with fewer than 1 HD are considered 1st level/1 HD for the sake of the amulet's chances of success and number of rounds until resurrection. Once the ankh has successfully resurrected a character (regardless of HD/level), that benefit is considered expended and it becomes a simple ankh of protection +1.